The first formation of the La Scala String Quartet is historical and dates back to 1953 when its lead mambers felt the need to follow the example of the worls’s greatest orchestras and work on developing an important chamber music project. 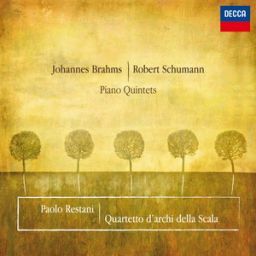 In the course of the following decades, the Scala’s Quartet was the protagonist of important musical events and recordings. After a pause lasting some years, in 2001, four young musicians, prize-winner of international soloist competitions as well as section’s leaders of the Theatre’s Orchestra, decide to give new life to this prestigious formation. By further developing their musical affinities, already well established within the Orchestra, they elevate these to that maximum expression of chamber music typical of the String Quartet. The La Scala String Quartet, has been invited in some of the most important chamber music festival in Italy (MusicaInsieme in Bologna, Serate Musicali, Società dei concerti e stagione “Cantelli” in Milan, Associazione Scarlatti in Naple, Sagra Malatestiana a Rimini,Amici della Musica in Palermo, Estate Musicale in Portogruaro, Asolo Musica, Ravenna Festival, Teatro La Fenice and Malibran in Venice, Stresa, Teatro Bellini in Catania, Teatro alla Scala ecc.) and abroad (Brasil, Perù, Argentina, Uruguay Japan, United States, Croazia, Germany, France, Spain ecc. ) . They recorded for DAD, Fonè, Decca. In 2008 they had concert at the Salzburg’s Mozarteum. In 2012 they won the critic’s price as best forein chamber group in Argentina. They had collaborations with eminent soloist such as J. Swann, A. Hewitt, E. Pahud, and the tenor J. Carreras. Maestro Riccardo Muti wrote about them:” the quartet stands out for its technical and musical excellence,…the quartet ensures beauty of sound while its performance of the cantabile parts proves that it is very familiar with opera music, making listening a joy and pleasure indeed”.